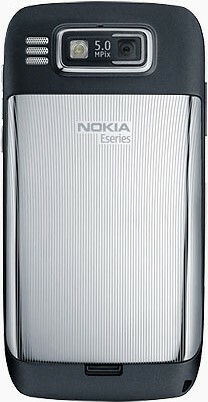 The major attractions of Nokia E72 are its computer like capabilities to sent and receive emails, access company networks, process office documents etc. There is an optical track pad for easy navigation over menus and options. E72 supports faster HSUPA, HSDPA networks and tri-band UMTS. Nokia manged to keep the design sizes in its limit though there are few extra features than older models. E72 includes premium Nokia applications like Nokia messaging and Nokia push email services. Therefore users can access instant messengers, email services and allied service right from the phone home screen. 5 mega pixel auto focus with LED flash 15 fps video recording and 2592 x 1944 pixels photos. Front VGA camera for video calls. 2.36 inch TFT display with 16 million colors and 320 x 240 pixels resolution. Accelerometer, optical trackpad and QWERTY keypad. Measures 114 x 58 x 10 mm and 128g in weight. Available in three colors Topaz Brown, Zodium Black and Metal Grey. Assisted GPS, compass, GPRS, WLAN, GPRS, EDGE, 3G , Nokia VOIP 3.0, Bluetooth with A2DP, 600 MHZ ARM 11 processor, music player, Document viewer and editor, full web browser, 1500 mAh bttery, FM radio with RDS , Flash support, 128 MB RAM, 250 MB internal storage expandable upto 16GB. 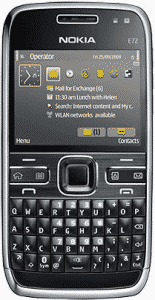 Nokia E72 is the new flagship business phone from Nokia. 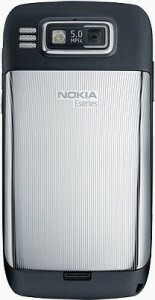 The expected price of Nokia E72 in European markets is around EUR 370. So when it come to India it will cost 25000 INR approximately. 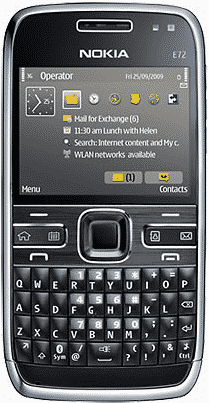 Nokia E72 includes all the amenities required in a business phone, with stylish looks and sleek design. It would be a great buy if available at this price.